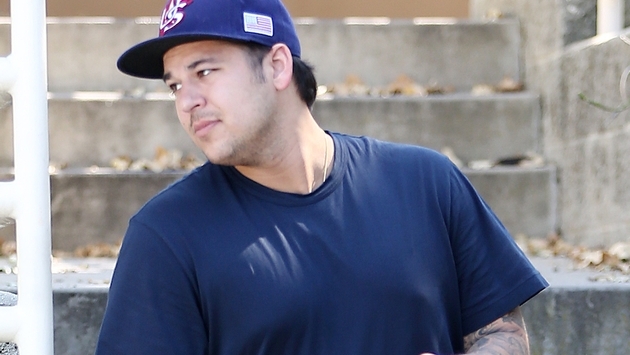 It was recently reported that Kris Jenner was demanding Rob Kardashian to attend fat camp. And it looks like the reality star mom may have gotten her way. Kris was spotted boarding a private plane at Van Nuys Airport on March 24, and was apparently taking her son to participate in a weight-loss program. A source close to the family reportedly told X17 photographers that the pair were headed to a fat camp after they were seen boarding the jet. Kris was pictured, but it appears as though Rob may have already been on the plane. Rob’s alleged enrollment at a weight-loss camp comes a week after his 27th birthday. His famous family celebrated with a St. Patrick’s Day-themed party. Kris reportedly demanded that Rob drop 70 pounds before Kim Kardashian's wedding to Kanye West, which is rumored to be taking place May 24. Rob, who allegedly weighs approximately 260 pounds, is reportedly considering undergoing stomach stapling surgery to meet the deadline. "Rob hates gyms," an insider told the National Enquirer. "But he's under strict orders from Kris to lose 70 pounds before Kim's wedding to Kanye West this summer. Rob figured that getting his stomach stapled is the only way to meet Kris' deadline." Furthermore, a source told Star: "[Kris has] told [Rob] that if he wants to continue to be an active part of their family, he's going to attend a camp and lose the weight once and for all." Hopefully, if Rob is attending a weight-loss camp, his efforts pay off. Rob reportedly attempted a similar camp not too long ago with little to no results. "When he came back, he didn't look very different from when he left and Kris was not happy," the insider said. What do you think? Should Rob attend a weight-loss camp?